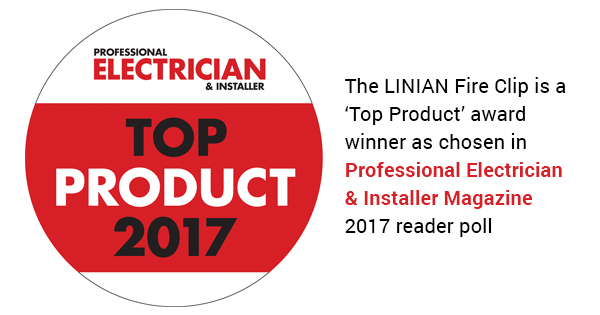 The LINIAN Fire Clip has been chosen as one of the Top Products of 2017 by Professional Electrician & Installer Magazine readers. This is a massive achievement as it’s been chosen by the people that use the products day in and day out. The awards, selected on the level of interest and enquiries generated by PE’s 70k+ readership, are recognition for those manufacturers and suppliers that have made a real difference to the electrical contractor’s ability to get the job done efficiently, safely and professionally, whether this is in the form of innovative products, tools or time-saving solutions. Professional Electrician & Installer Magazine Editor, Richard Bowler said: ‘Our annual awards are a great way to reward those companies that have come up with excellent ideas to help electrical installers and businesses overcome common problems in their everyday work or open up new profit streams. The Fire Clip from LINIAN is therefore a very worthy winner of one of our 2017 Top Product awards’. LINIAN offer a range of products and earlier this year they introduced the new 9 – 11mm double enhanced LINIAN Fire Clip. This product is capable of retaining two Enhanced Grade Soft Skin Cables within a single fire rated fixing. Ian Arbuckle, Managing Director at LINIAN, was excited by this new status: ‘The new 9-11 double (For Enhanced Grade Soft Skin Cabling) was created to allow the same LINIAN features and benefits to be delivered to installers using Enhanced Grade Cable. We are delighted that we have received this ‘Top Product’ title because the people who use our product are the ones that have voted for it’. As with all the LINIAN products, this Fire Clip is three times faster to install than traditional methods. It is expertly designed to save time, money, and lives, without the use of wall plugs or screws. It is also compliant with the recommendations for Fire Rated Cable Fixings BS7671 Amendments 3. To date, they have sold 2 million LINIAN Fire Clips – which provides a time-saving alternative for installing fire resistant cables on brickwork, concrete, masonry, wood studs and wood beams compared to conventional methods. LINIAN is continuing to grow, with more stockists coming on board every day. There is no other product like the LINIAN Fire Clip that is readily available on the market. Have a look at our stockist map to find your nearest LINIAN Fire Clip supplier.